Every year, as the students of San Clemente High School ease into daily routines, they are presented with opportunities to join clubs and increase their involvement. This year was different though, as TED-Ed made its first appearance. TED-Ed was at the forefront of the annual Club Rush, which features all sorts of clubs, ranging from the SCHS Hockey club to the Anti-Vape club. 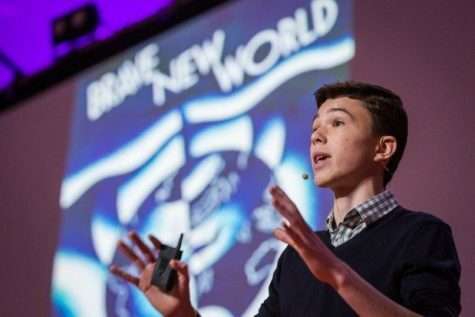 The new club encourages students to sign up for a 13-lesson course on how to give a TED Talk, brought to the school by club leader Jason Keany. The TED-Ed club provides students with an opportunity to give a well-researched and well-prepared speech on a topic they are passionate about. Whether it be about the lessons we learn from loved ones, the power of generosity, or how daily trips to the beach shape our lives, the TED-Ed club will prepare students to masterfully formulate a speech which will be recorded and sent to TED. After analysis, should the reviewers at TED decide the student’s presentation meets their standards, TED will upload the student’s video. The president and founder of the club, senior Jason Keany, is excited to have the opportunity to “share [his] dream of doing a TED talk with my fellow students, and have them be just as excited as [him].” Passionate and motivated students, when given the ability to tell their stories, have the power to change the world and realize their passions. Writing and presenting a TED talk not only grants students with an opportunity to share their message and change other’s perspectives, but allows students to learn a great deal about themselves, while forming friendships that will last a lifetime.